Of the three plays I’ve seen by Jordan Tannahill, Concord Floral is by far the most successful. Here he fully masters a style he has been pursuing that one might call surreal suburban gothic. The style and some of the themes of Concord Floral were evident in Post Eden (2010), but here he is in complete control of both. The effect is profoundly unsettling. The is written for and performed by teenagers and it is clear that Tannahill’s writing helps them express the amorphous sense of dread that has begun to characterize their generation. The title of the play refers to a million-square-foot abandoned greenhouse located just above Highway 7 in Vaughan. The actual greenhouse it is based on was demolished in 2012. Over the years it had become a hangout for neighbourhood teens to have parties, take drugs or have secret assignations. Tannahill’s story focusses on two girls, Rosa Mundi (Jessica Munk) and Nearly Wild (Erum Khan), who go to Concord Floral one night to smoke some pot. Neither has brought weed, papers or a lighter and in searching their pockets, Rosa drops her phone down one of the many treacherous holes in the floor. When Nearly uses the flashlight function of her phone to peer down the hole, the two are horrified to see the dead body of another teenaged girl. Afraid the police will wonder what the two were doing in Concord Floral, the girls resolved to tell no one about what they found. Nevertheless, the story leaks out and soon all the students at high school know about it. Matters take a turn for the worse when Nearly begins receiving phone calls from the dead girl Bobbie (Jovana Miladinovic). Most students, including Rosa, assume Nearly is staging the phone calls to draw attention to herself and thus begin to shun her. Other teens, however, like Forever Irene (Melisa Sofi) and Just Joey (Liam Sullivan), who have their own secrets, notice that Nearly’s light is on at night and that she can’t sleep. For Irene’s brother John Cabot (Theo Gallaro), an amateur ornithologist, Nearly’s situation (and by extension, the situation of all the teens at school) is like that of a bobolink that once flew in the cafeteria window and kept bashing itself against the closed windows in a panic to get out. Tannahill’s tale tips from the gothic into the surreal when we hear this story told by the Bobolink himself (Troy Sarju), who also mentions how worried he is about news that the greenhouse will be torn down since that has been the mating and nesting area for his kind for generations. Tannahill also lets us hear from a Fox (Eartha Masek-Kelly), who uses the greenhouse for refuge. Moving from the animate to the inanimate, Tannahill has an old Couch (Sahra Del) tell us the scenes of debauchery that have happened on her cushions. Indeed, the narrator of the story is the Greenhouse herself (Rashida Shaw), who introduces the scenes and places her existence as a building in a larger historical context. Tannahill clearly uses surrealism not to pursue strangeness for its own sake, but to universalize the teens’ experiences. The animism inherent in talking animals and objects links up perfectly with apparent survival of Bobbie’s spirit. As the 80 minutes progress the question changes from the specific torment that Nearly is suffering due to Bobbie’s phone calls and visits, to the general sense of dread that begins to infect Nearly’s entire class. As the mystery unfolds it turns out that the entire class was responsible in some way for the disappearance of their classmate the previous year. Tannahill says in his “Playwright’s Note” that one inspiration for the play is The Decameron (1370) by Giovanni Boccaccio (1313-75). In it ten teenagers – seven women and three men, the same make-up as Tannahill’s cast – flee Florence where the plague is raging to seek shelter in a deserted villa. The Decameron consists of the 100 stories they tell while waiting for the plague to pass. In Concord Floral, Tannahill has his Grade 10 students studying Boccaccio’s masterpiece in class. The only real parallel between the two works is that the ten teens in Boccaccio and in Tannahill use a deserted building as a refuge. The significant difference is that the greenhouse now provides no refuge from the plague but rather becomes the source of the dread that plagues the teens. A workshop production of Concord Floral made extensive use of video backgrounds. Thankfully, all of that has been scrapped. The story is made much eerier simply through Kimberly Purtell’s lighting to create squares of brightness in the midst of darkness and Christopher Willes’s highly effective score of real-world sounds. The stage action takes place entirely on a large square swath of artificial grass, inhabited by all except the actor playing Bobbie. The three directors – Tannahill, visual artist Erin Brubacher and choreographer Cara Spooner – work together in such harmony, you would assume the production were the product of a single mind. It is absolutely right to cast teenagers to play teenagers, even though their skills as actors vary widely. Even though they are all miked, enunciation is no one’s forte. Too often words we would love to hear are spoken too rapidly or pass by in indecipherable mumbles. The four actors most successful at avoiding this flaw are Khan, Miladinovic, Munk and Sullivan. As in Post Eden, Tannahill is fascinated by the negative effect that growing up in the rootlessness of suburbia has on is young inhabitants. In Concord Floral, he also shows that despite the supposed interconnectedness made possible by modern social media, growing up as a teenager is still characterized by loneliness and that teens do not hesitate to mock the loneliness of others that they feel inside themselves. This journey into cruelty as an expression of self-hatred is what makes Concord Floral so powerful. We would like to believe the assessment of the Greenhouse that “10% of people are cruel. 10% of people are merciful”, but Concord Floral shows us a group of young people who discover they can find no mercy for themselves. Note: This is a Stage Door exclusive. For the productions in Ottawa and Toronto in 2016 some of the cast changed. Some like Theo Gallaro, Jovana Miladinovic, Jessica Munk, Melisa Sofi and Rashida Shaw were still in the cast and the creative team is the same, though Jordan Tannhill is no longer the co-director. At the Bluma Appel Theatre the staging had significantly changed. 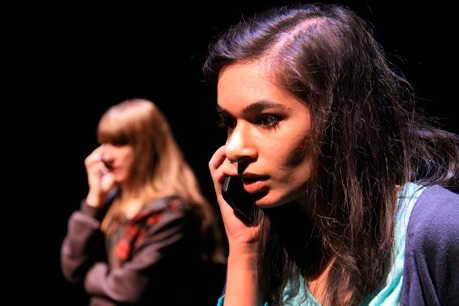 Photos: The cast of Concord Floral; Jessica Munk and Erum Khan. ©2014 Erin Brubacher. For tickets, visit www.theatrewhynot.org, http://nac-cna.ca/en/event/11730 and www.canadianstage.com.